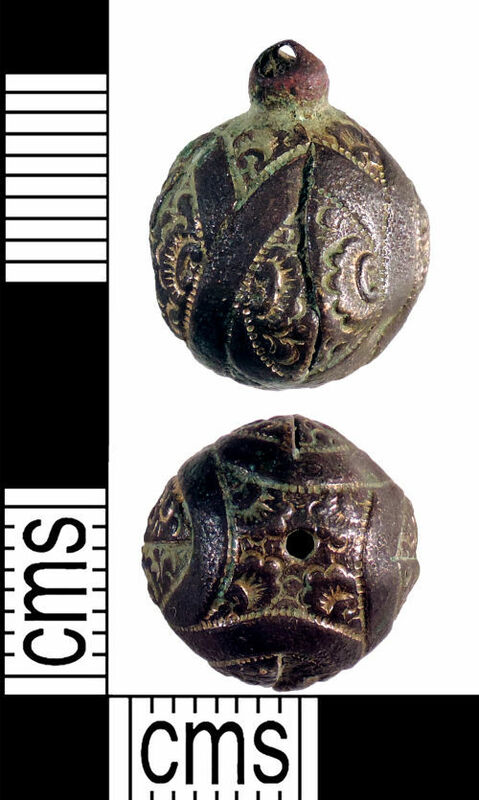 A complete copper alloy pendant or button of post-medieval date. The object appears to be comprised of four ovate panels folded and soldered together to form a sphere. A small circular, domed attachment loop is present at the top of the object while a small circular perforation exists at the opposing point. The outer surface of the object is elaborately decorated with double opposing helical bands and foliate designs within the resulting gaps. Gilding remains within the recesses caused by the decoration. The metal has a dark reddish-brown patina and is worn. The object is 16.6mm long, 12.6mm in diameter and weighs 2g. The fitting on this object is similar to that on 2005 T283 (PAS-DF2C67) which would support the theory it is a pendant however, in the absence of a clear parallel, this cannot be definitively attributed to a particular object type.